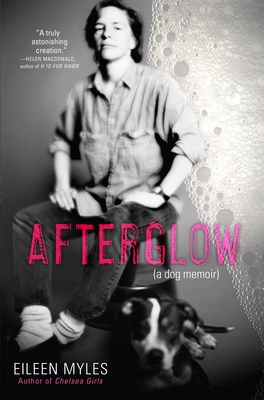 In AFTERGLOW (A DOG MEMOIR), Eileen Myles writes, "We can connect to Dog. Hound of the Ocean as the ancients once said." Of course, "Dog," as Eileen Myles refers to her is not only Rosie, Myles's beloved pit bull companion. "Dog" is also "God"; "Dog" is the truest form of the self. "Dog" defies convention and societal constructs and is, thus, the self at its freest, at its most queer. Enter: "Foam," which is the queerest known substance. Enter: Myles, who ventures deeper into the self, into her own history, than she ever has before. Enter: Myles contemplating foam and how to write foam. Enter: Myles as she queers the form of the memoir. Enter: Myles as she liberates "God" from its patriarchal historical context. Enter: Myles in "Dog" form. Enter: "Dog" in Myles form. Enter: something inspired and truly divine. Enter: Myles's most impressive book yet. It's a wild thing. Wilder perhaps than any of Myles's previous works of fiction. It is bold and loud and brave, and it's as much of a privilege as it is a pleasure to read.